Need a good laugh? Who doesn’t? Find mirth and spiritual refreshment in Heavenly Humor for the Teacher’s Soul, featuring devotional readings drawn from fellow teachers and those who love them. Seventy-five readings will make you laugh, chuckle, chortle, and snicker. And every reading points you to the heavenly Father who knows all about you—and loves you completely. Compilation features 75 devotional readings drawn from fellow teachers and those who love them. Each entry provides a smile, chuckle, or good old-fashioned belly laugh, as well as a thought-provoking spiritual point. It’s ideal for starting or ending a day, or for a quick pick-me-up in between. Need a good laugh? Who doesn’t? Find mirth and spiritual refreshment in Heavenly Humor for the Teacher’s Soul, a devotional drawn from fellow teachers and those who love them. 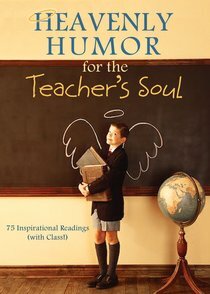 About "Heavenly Humour For the Teacher's Soul"
Compilation features 75 devotional readings drawn from fellow teachers and those who love them. Each entry provides a smile, chuckle, or good old-fashioned belly laugh, as well as a thought-provoking spiritual point. It's ideal for starting or ending a day, or for a quick pick-me-up in between.